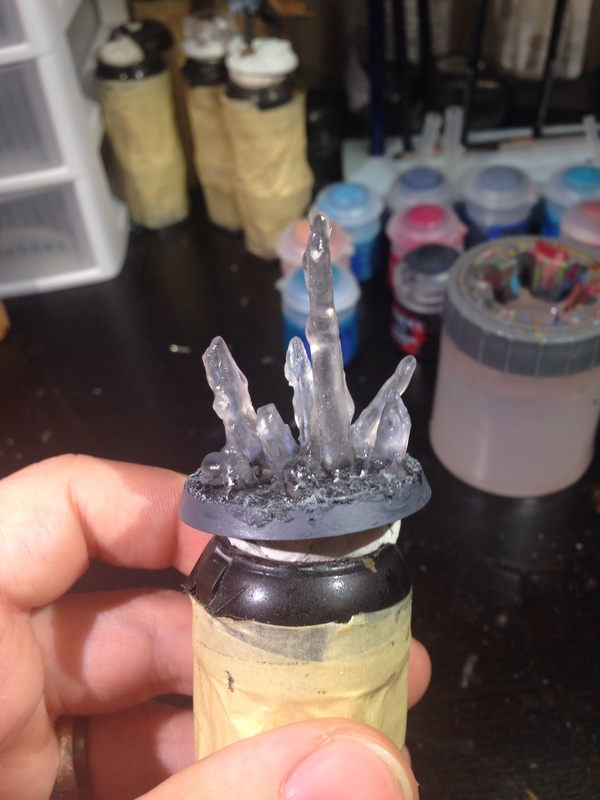 A little while back I saw a great video tutorial on how to do a really cool ice basing technique. 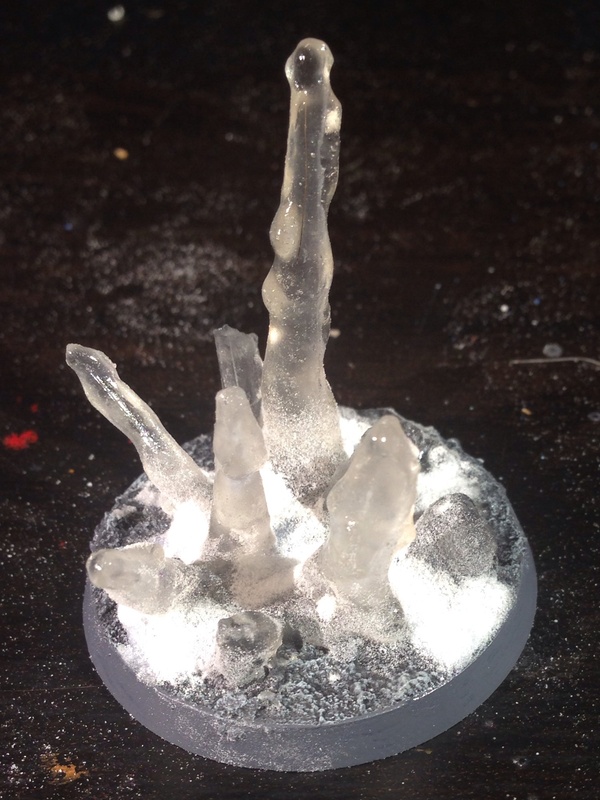 As the Malifaux crew I have been working on is ice themed, I thought technique could end up looking really cool with them. 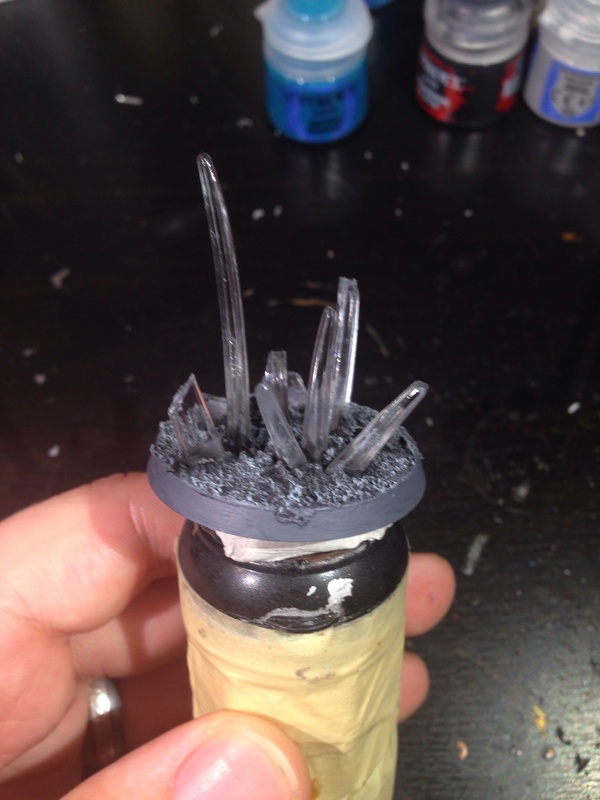 Because the materials used in this technique end up making it a very permanent form of basing I thought I should give it a test run before actually using it on one of my models, so I made a test base that I’m going to end up using as a objective marker for Warhammer 40k. The video I originally saw this technique in doesn’t appear to be available anymore, so I figured I should post a step-by-step tutorial on how to do this technique. 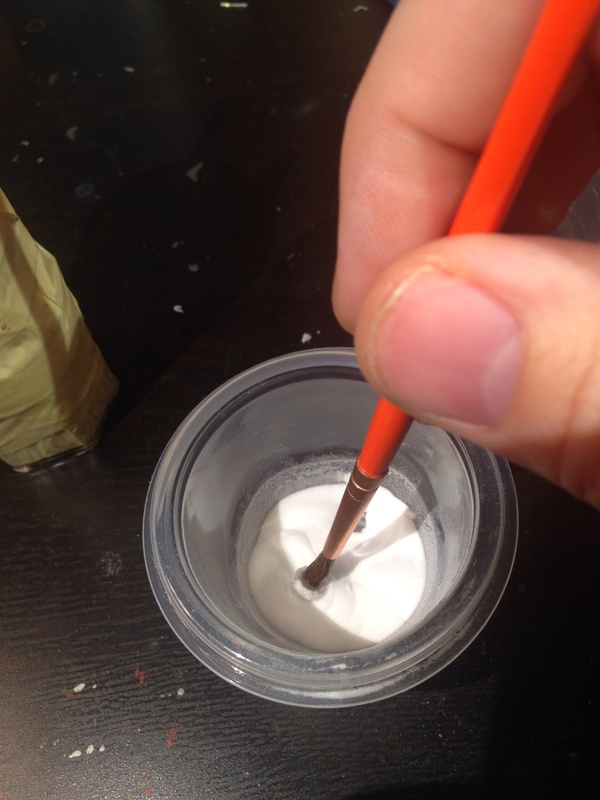 For this technique you will need a couple special materials not found in the standard hobbyist’s painting and modeling kit. 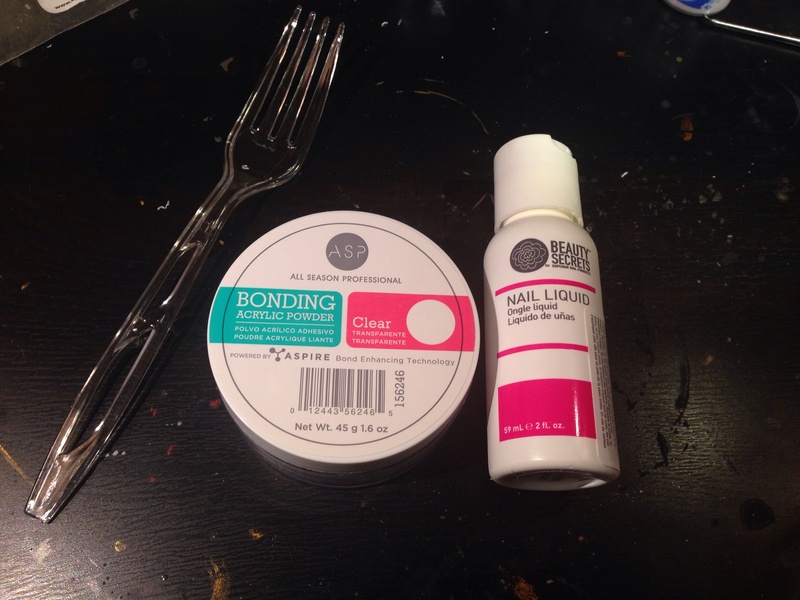 Specifically you will need clear plastic forks, clear acrylic nail powder, and acrylic nail liquid. The acrylic nail powder and liquid can be found at beauty supply stores (I found mine at a nearby Sally Beauty Supply and definitely got some odd looks when I walked into the store). You will also need your standard hobby supplies and a set of cheap brushes. 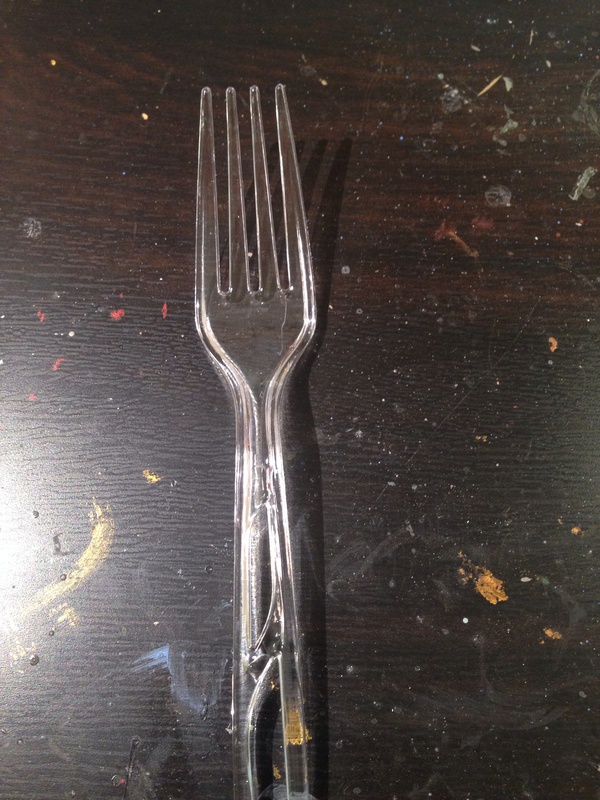 To make the cores of the icicles, cut the tines off of one of the plastic forks at varying lengths. 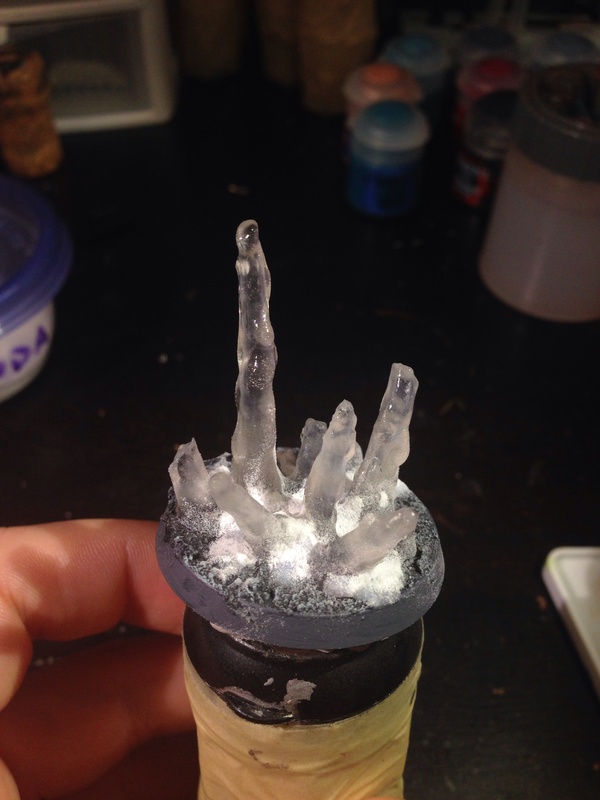 I took a spare 40mm base and super glued several of the fork tines onto it; for a base with an actual model on it I would end up adding fewer icicles than I did for this test, but I wanted as many opportunites to play around with this technique before I use on models I care about. Around the tines I used some of the Games Workshop texture paint which I gave a quick drybrushing once it was dry. You can super glue the fork tines to any base you have–the Malifaux crew this was a test run for are mounted on some nice resin bases, but I didn’t want to ruin one of those learning how to do this technique. Once your base is ready to go, it’s time to prep your nail acrylic for action. I cannot stress enough how important it is to do this in a well ventilated area; you know how if you’re walking around the mall you can smell that nasty chemical nail salon smell from a good distance off from a nail salon? Well, with this technique you are working with the chemicals they use in there and they have a strong oder. Next time I work this this I will be wearing a mask in addition to being in a well ventilated area. 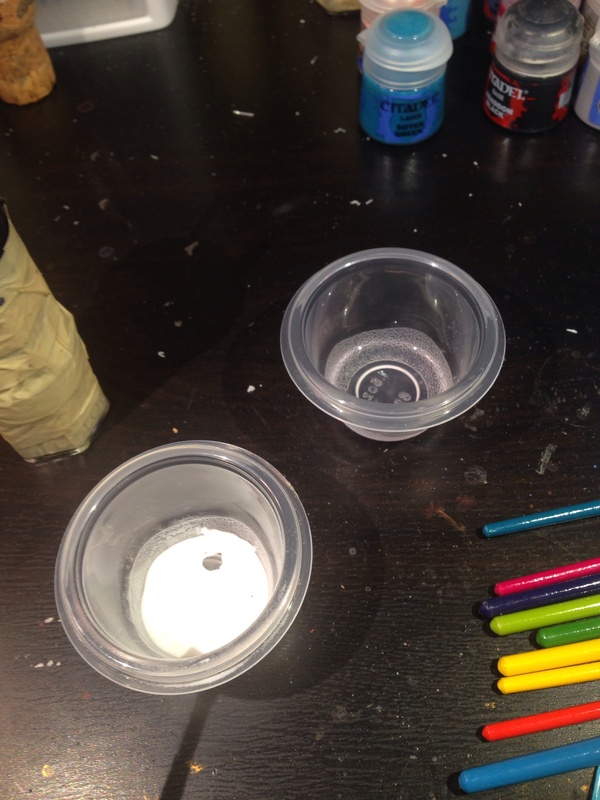 I put a small amount of the acrylic nail powder into a small cup and the nail liquid into another so as not to accidentally contaminate either of their containers while making the base. As with most of my projects, I used some poster putty to attach the base to a handle to make it easier to hold while adding the acrylic to the base. This also helps keep you from getting any of the acrylic onto your hands. Take one of your cheap brushes and dip it into the nail liquid. 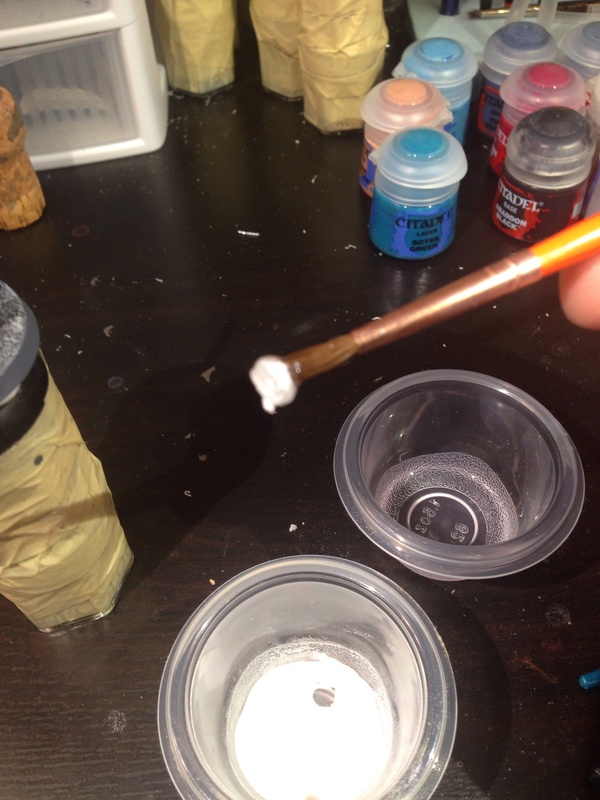 Then dip the wetted brush into the acrylic powder to gather a small amount onto your brush. When the powder comes into contact with the liquid it will form a clear, sticky goo that can then be built up onto the fork tines on your base. You can also put it directly on the base or dripping down a ledge. 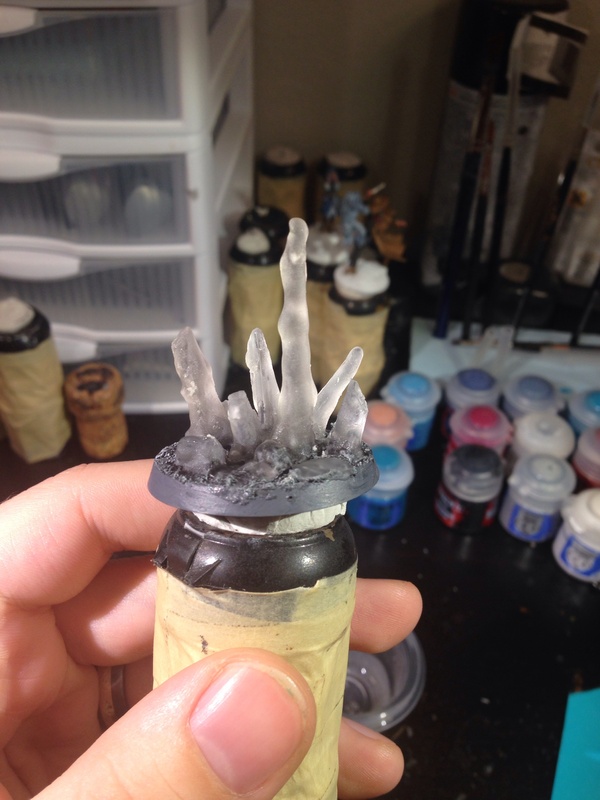 The acrylic sets up relatively quickly so you don’t want to leave the blob of it on your brush for too long, but it does stay pliable long enough to sculpt it some. 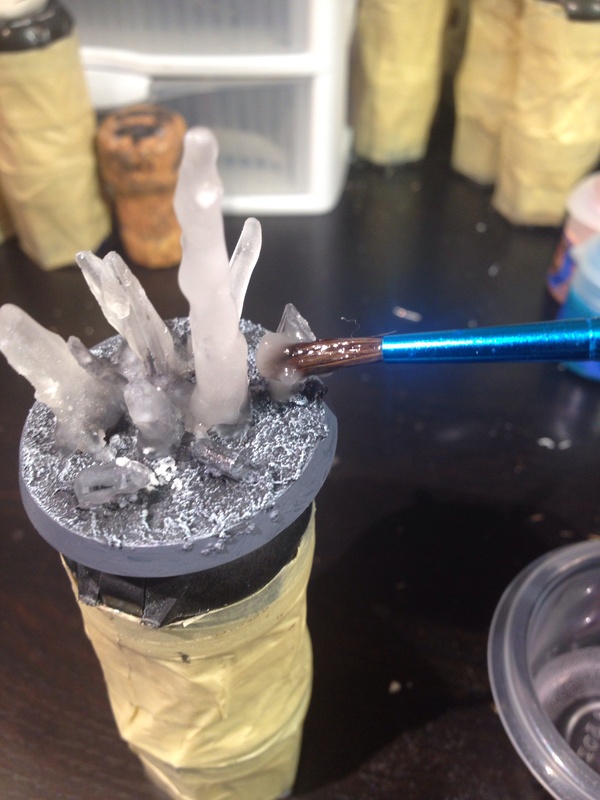 Gradually build up the acrylic onto the tines and base until you have the amount of ice you want on your base. As you can see in this and the previous picture the acrylic sets up to be mostly clear but with a bit of a frosted, matte exterior. I could see this being a good look in some circumstances, but I wanted my ice to be clear and shiny. I took a little bit of gloss varnish and painted it onto the ice crystals and they cleared right up and got nice and shiny. 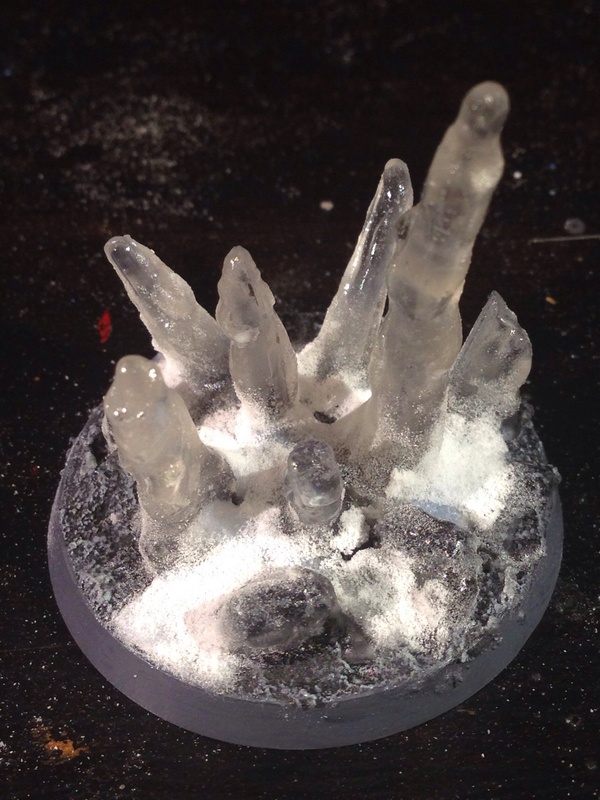 Once all of the varnish had dried, I added some snow to the bases and voila, finished ice base! 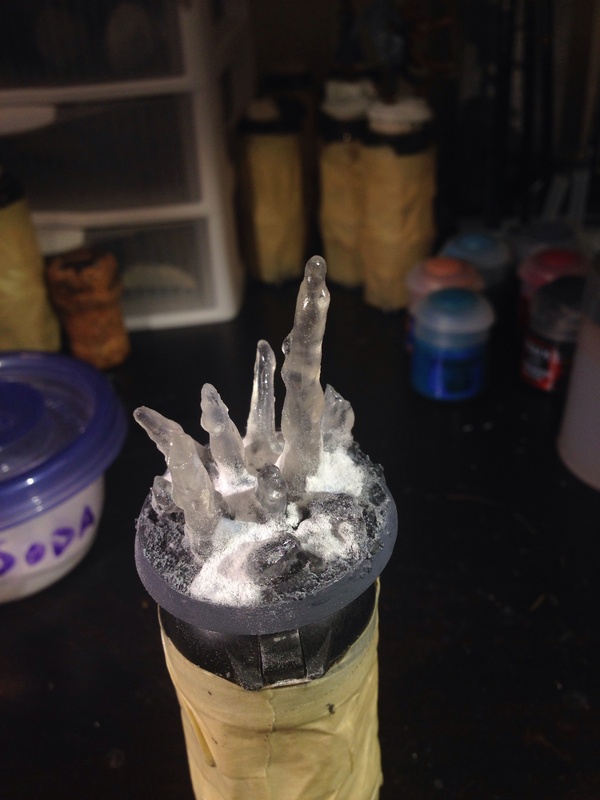 I am really happy with the way this turned out and can’t wait to add some ice to the bases of Rasputina and her icy crew! If you have any questions or comments, let me know. According to the original video tutorial I learned this method from you can add a drop or two of a wash to the nail liquid to color the resulting crystal but still have it be clear. I have not tried coloring the acrylic, but I could see how that could make a really cool look. This is an absolutely brilliant tutorial! The end results speak for itself! I wish I saw this before I sold my Space Wolves army! I’m gonna have to steal some back from my friend and give this a shot! Please feel free to swing by my blog and check out some of my work! That looks great. Of course, you have to leave room for the miniatures too. 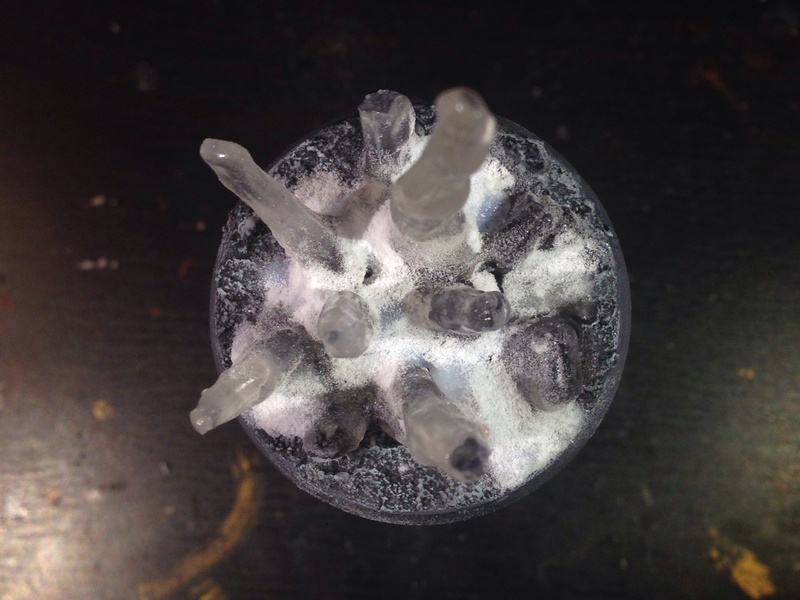 They would work a treat for Rasputina’s Ice Pillars. Great post! That looks really good! Do you know if this liquid and powder are the same as used in dentistry? I don’t know whether or not it’s the same kind of liquid and powder used in dentistry as I am particularly familiar with such dental procedures. I pick mine up at a local beauty supply shop in the nails section (always get weird looks when I enter the shop too as I am clearly not their usual client) . I wouldn’t want this stuff anywhere near my teeth as it has quite the powerful odor and should be worked with in a well ventilated area. Awesome tutorial, will try asap. Thanks for sharing!